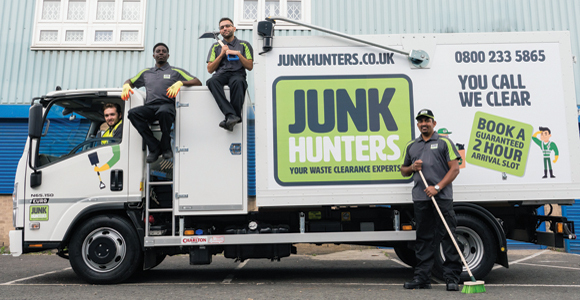 A London-based waste removal franchise, Junk Hunters, has chosen Birmingham as the location for its first operation outside the capital. The Birmingham branch will cover the city and surrounding areas stretching out to Solihull, offering its rubbish collection service to households and businesses. Junk Hunters’ commits to recycling and reusing as much waste as possible that it collects from customers and says it currently recycles 75 per cent of all items, with plans to reach an 80 per cent target in the coming years. Harsha Rathnayake, chief executive of Junk Hunters and area manager, Romesh Gilles, believe that Birmingham has plenty of demand for a quality junk clearance service and that last year’s council bin strikes may see more businesses willing to use a private provider to collect and recycle their unwanted items. Rathnayake founded the company in London in 2009 with a second-hand tipper truck and £160. The company says the business now has a turnover of more than £1m a year with a fleet of vans and over a dozen employees. Junk Hunters sees its commitment to recycling and reusing waste and top-quality customer service as being an essential part of the business, with frequent repeat customers a main driver to success. The company says that the branded and clean vehicles, guaranteed delivery slots and uniformed, polite staff have also been central to business growth. Rathnayake said: “Following a successful nine years in London, we’re delighted to launch in Birmingham. Junk is big business that continues to grow. Businesses and domestic customers always have waste they need to clear, and they want a reliable company who will clear their rubbish and dispose of it responsibly. “Unwanted junk leads to fly-tipping which damages the environment. There is a real need for a responsible operator in Birmingham who is committed to disposing of unwanted items properly. “We aim to recycle and reuse as much of the junk we collect as possible. Some gets sorted and sent to the recycling plant; items from house clearances and office clearances that can be reused get taken to charity shops or facilities where the items can be resold. “We’ve worked hard since I launched the business to grow it to where it is today and during the last five years we have seen profits rise annually. Junk is not a glamorous business but it’s an industry that provides a vital service and one that we are passionate about. The company will collect a wide range of unwanted items from households, building sites and commercial premises including IT equipment, office furniture and industrial waste. The service also offers householders an advantage over using skips for rubbish disposal, which can often be left unsightly outside awaiting collection. Junk Hunters is planning to open up to nine other branches this year with new centres scheduled for Surrey and Slough, followed by further sites in the East Midlands, London, the South East, Wales and Yorkshire.